Designed like many of Dunlops Grandtrek range to try and meet both the demands of the off road driver and those seeking a smooth and comfortable on road experience, the PT4000 N0 edition has been born. 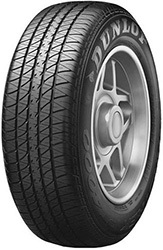 This special edition of the PT4000 has the N0 stamp on the tyre sidewall indicating the approval given by Porsche to use this tyre as original and replacement equipment on some of it's vehicles. With a tread pattern designed with wide comfort grooves aimed at dispersing water and reducing external noise, the Dunlop PT4000 N0 is a great choice for anyone looking for a high end 4x4 or SUV tyre offering on road perfomance.